Microsoft .Net Framework is an essential utility these days as most of the softwares need it. But there are several versions of it. Sometimes due to version conflicts or incomplete installations you may encounter problems. Here’s a .Net Framework Removal tool that helps you to uninstall any version of Microsoft .Net Framework. 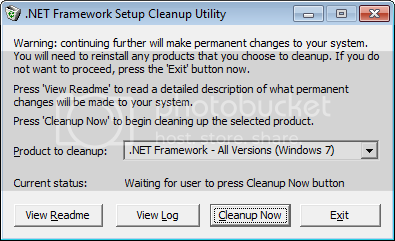 You can easily remove .NET Framework 1.0, 1.1, 2.0, 3.0 and 3.5 versions with a single click.